New York — At a seasonally adjusted annual rate of $708.1 billion, new construction starts in February slipped 3 percent from the previous month, according to Dodge Data & Analytics. The reduced activity in February followed a 2 percent decline in January, as the early months of 2018 are showing some loss of momentum after the 12 percent increase reported back in December. The nonbuilding construction sector, comprised of public works and electric utilities/gas plants, fell 23 percent in February, resulting in the decline for total construction starts for the second month in a row. In contrast, nonresidential building grew 5 percent in February, continuing the strengthening trend which resumed in December, and residential building improved a slight 1 percent. During the first two months of 2018, total construction starts on an unadjusted basis were $102.4 billion, down 7 percent from the same period a year ago which had been lifted by the start of several unusually large projects, including the $3.6 billion Central Terminal replacement project at LaGuardia Airport in New York City. On a 12-month moving total basis, total construction starts for the 12 months ending February 2018 were up 2 percent from the 12 months ending February 2017. Nonbuilding construction in February was $118.2 billion (annual rate), down 23 percent from January. The electric utility/gas plant category was particularly weak, plunging 83 percent as the largest project entered as a February start was a $40 million electric substation upgrade in California. In January, the largest electric utility project entered as a construction start was an $872 million natural gas-fired power plant in Louisiana. The public works categories as a group dropped 17 percent in February, including a 54 percent plunge for miscellaneous public works which includes such diverse project type as pipelines and mass transit. In January, the miscellaneous public works category had climbed 22 percent, reflecting the start of the $2.0 billion NEXUS natural gas pipeline in Ohio and Michigan. In February the largest miscellaneous public works project entered as a construction start was a $225 million light rail project in Bellevue, Wash. The river/harbor development category also experienced a steep decline in February, sliding 36 percent. 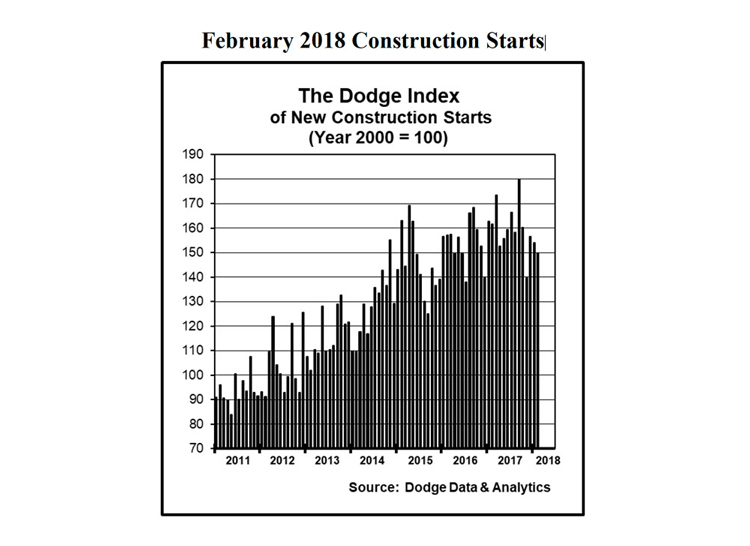 On the plus side, highway and bridge construction grew 11 percent in February, climbing back to within 2 percent of last year’s average monthly pace after a sluggish January. Large highway and bridge projects entered as February construction starts were the $545 million Gateway Expressway project in the Tampa, Fla., area, the $441 million replacement of the Frederick Douglass Memorial Bridge and Suitland Parkway project in Washington, D..C, and a $225 million roadway and bridge improvement project in Norristown, Pa. Sewer construction and water supply construction both rebounded in February, climbing 36 percent and 10 percent respectively. Nonresidential building in February was $246.7 billion (annual rate), up 5 percent from January. The commercial categories as a group rose 14 percent, with gains across most of the structure types. Office construction advanced 24 percent after a subdued January, boosted by the start of two large data centers – a $600 million Google data center in Clarksville, Tenn., and a $183 million Facebook data center in Ft. Worth, Texas. Other large office projects that reached groundbreaking in February were the $220 million Cerner Corporation Campus in Kansas City, Mo., the $200 million Turkish consulate office building in New York City, and the $140 million Stafford Place renovation project in Arlington, Va.
Hotel construction jumped 60 percent in February, featuring the start of three noteworthy projects – the $250 million Loew’s Kansas City Convention Hotel in Kansas City, Mo., the $225 million Grand Hyatt Airport Hotel at San Francisco International Airport, and the $180 million Margaritaville Hotel in New York City. Commercial garages climbed 42 percent in February, with the lift coming from a $130 million parking expansion at Midway International Airport in Chicago. Store construction registered a 6 percent gain in February, helped by the start of the $271 million expansion of the Bal Harbour Shops in Bal Harbour, Fla.. Warehouse construction in February was the one commercial structure type to decline, sliding 36 percent, although the latest month did include a $100 million Big Lots distribution center in Apple Valley, Calif. The institutional categories as a group increased 5 percent in February, boosted by a 52 percent surge for new health care facilities. There were six health care facilities valued each at $100 million or more entered as February starts, led by the $400 million Boston Children’s Clinical Building in Boston, the $320 million Prince George’s County Regional Hospital in Upper Marlboro, Md., and the $180 million expansion to the University of Mississippi Medical Center Children’s Hospital in Jackson, Miss. Educational facilities increased 10 percent in February, aided by large high school construction projects in Townsend, Del. ($149 million), Herndon, Va. ($84 million), and Nashville, Tenn. ($83 million), plus groundbreaking for a $145 million science facility at Towson University in Towson, Md. For the smaller institutional categories, gains were reported for religious buildings, up 32 percent; and public buildings, up 9 percent; while declines were reported for amusement-related work, down 37 percent; and transportation terminals, down 38 percent. The decline for amusement-related work followed a very strong January that included the start of the $1.3 billion domed football stadium in Las Vegas for the soon-to-relocate Oakland Raiders, and February did see groundbreaking for the $363 million World Trade Center Performing Arts Complex in New York City. The manufacturing plant category dropped 48 percent in February after its elevated January amount, with the largest February project being a $200 million tissue plant in Macon, Ga. Residential building in February was $343.3 billion (annual rate), up 1 percent from January. Multifamily housing increased 7 percent, reflecting the start of 11 projects valued each at $100 million or more. Leading the way was the $700 million City View Tower at Court Square in Queens, N.Y., followed by a $300 million high-rise condominium building in Miami and a $215 million high-rise condominium building in New York City. In February, the top five metropolitan areas ranked by the dollar amount of multifamily starts were – New York City, Miami, Washington, D.C., San Francisco, and Boston. Metropolitan areas ranked 6 through 10 were – Dallas-Ft. Worth, Denver, Phoenix, Orlando, Fla., and Chicago. Single family housing in February slipped 1 percent, easing back for the second month in a row following the modest increases witnessed during the second half of 2017. In February, single family housing by major region showed gains in the Northeast, up 12 percent; and the Midwest, up 8 percent; but declines in the South Atlantic, down 2 percent; the South Central, down 4 percent; and the West, down 5 percent. The 7 percent drop for total construction starts on an unadjusted basis during the first two months of 2018 compared to last year was due to reduced activity for two of the three main sectors. Nonbuilding construction fell 21 percent year-to-date, with public works down 12 percent and electric utilities/gas plants down 63 percent. Nonresidential building decreased 17 percent year-to-date, with commercial building down 12 percent, institutional building down 21 percent, and manufacturing building down 24 percent. For both nonbuilding construction and nonresidential building, the steep year-to-date declines reflected the comparison to elevated activity during the first two months of 2017. Residential building year-to-date increased 10 percent, with single family housing up 6 percent and multifamily housing up 19 percent. By geography, total construction starts for the first two months of 2018 versus the same period a year ago performed as follows – the Midwest, up 13 percent; the South Atlantic, unchanged; the South Central, down 12 percent; the West, down 15 percent; and the Northeast, down 17 percent. Additional insight is provided by looking at 12-month moving totals, in this case the 12 months ending February 2018 versus the 12 months ending February 2017, which lessens the volatility present in comparisons of just two months. On this basis, total construction starts were up 2 percent. By major sector, nonbuilding construction grew 1 percent, with public works up 9 percent while electric utilities/gas plants fell 24 percent. Nonresidential building also grew 1 percent, with institutional building up 3 percent and commercial building down 5 percent, while manufacturing building improved 16 percent. Residential building advanced 3 percent, with single family housing up 8 percent while multifamily housing retreated 7 percent.